Ruth Corset is now the second woman in history to win the National Road Series twice; an even more impressive feat when you think, earlier this year, she was willing to shift her cycling down a gear and forfeit her lead in the series she was dominating. There’s no doubt Ruth Corset’s priorities have shifted in recent years. 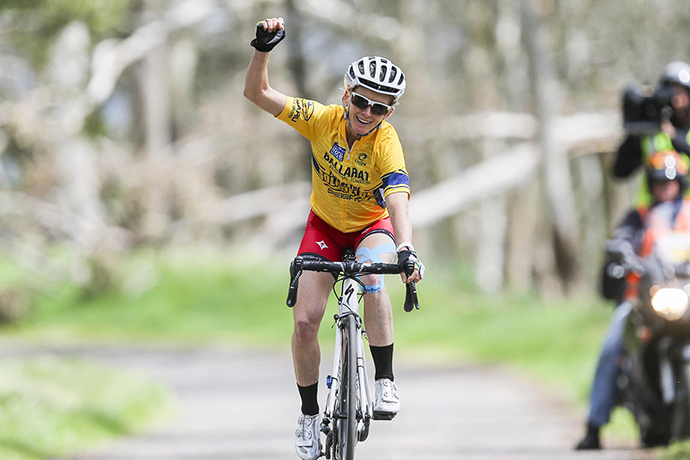 Once competing on the international stage in the Commonwealth Games, she now strives to stay on home soil and rule the domestic road racing circuit where she can also enjoy the dual success of being just a few hours’ plane journey from her family [daughters Caitlin, 10, and Stephanie, 12, and coach/husband Jason]. 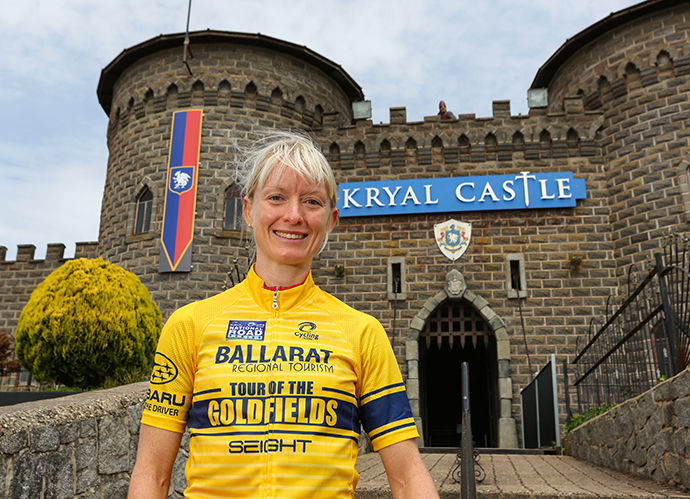 Claiming the Cycling Australia Subaru National Road Series 2014 title in mid October with her Holden Women’s Cycling team also taking victory in the eight-tour series; it’s been the fairytale end to a rollercoaster year for the queen of climbing. How do you feel about being the second female ever to win the National Road Series (NRS) twice [first time for Ruth was in 2012]? I actually didn’t know: I didn’t have any clue at all until I read it, and I thought, ‘Oh okay, no one told me!’ It feels great and Jason and the girls tell me how proud they are of me, which is lovely. I know you were very keen for the team to do well, so was that an extra bonus that they also won? Yes, definitely. It was a tough tour in the Goldfields because other teams were very aggressive, and especially on the last stage when they tried everything to take the lead from us. But we managed to keep everything under control: My teammates gave it 100% and we just all stuck together. Towards the end, I was starting to panic a bit when it got to a 1:20 gap because the three girls in the group in front of us could have then taken our lead, so that’s when I started to work up the speed to rotate through. We actually dropped a lot of girls doing that because it was so windy: a strong cross wind was putting everyone in the gutter. The girls were rotating through and leaving just enough room for me to get a draft, so anyone behind me didn’t get any benefit from it, which meant a lot of girls got dropped and we only had a small group of about 15 coming into that final climb. Being a strong climber, that’s where you would have nailed it and got the lead? The time gap started to come down coming into the climb, and my teammates were pleased that I started to catch the front girls on the climb. Miranda Griffiths was the one who rode really strong and led on that left hand turn into the climb. So she went as hard as she could with me on her wheel, which meant no one could attack before the climb. And that’s where I launched my attack from there and eventually caught the girls in the group ahead. Can other cyclists use that same approach in their team riding? Yes, definitely – I think that last stage was probably the best that we’ve worked as a team all year. We had a lot of other riders from other teams as well as race directors who talked to us afterwards and said how well we rode as a team: The other teams tried everything. In the end it’s such a good feeling that we worked so well together. Will you take this same approach next year? Well, the team is actually looking at going over to New Zealand to the UCI World Championship race in February. It’s in Wellington and will be over either three or four days with professional teams from Europe and America that come to race there. Will you need to modify your training to prepare? I will probably have to step my training up a bit as it will be another level. The first stage is a little bit longer, so I might have to do a bit more distance work. The tour is quite hilly, so I’ll probably be looking at doing maybe a few more Mount Stuarts, Castle Hills and combine them with a few of the other smaller hills in town as well. Are you pretty excited for next year based on the amazing results from you and the rest of the team? 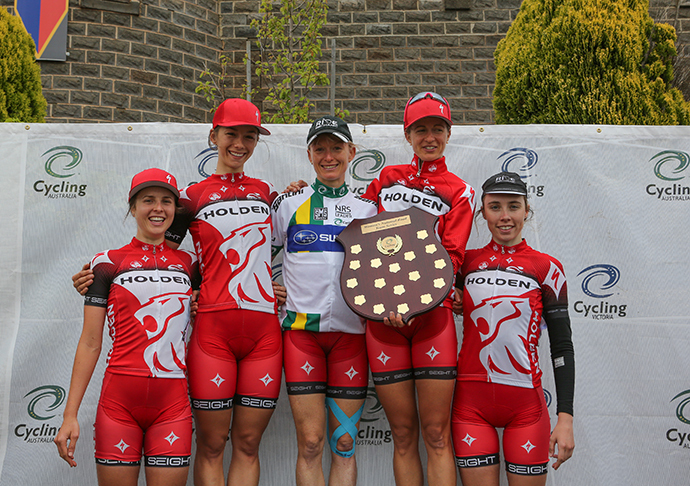 Yes, I think so because I’ve really enjoyed racing this year, and really enjoyed racing with the Holden Women’s Cycling team. I’m looking forward to doing another full year of the National Road Series with my team. I’ve just enjoyed my racing more-and-more as the year’s gone on. What do you think it was that flicked the switch to make you enjoy it that much more? I think realising that I’m not racing professionally anymore, and accepting that I don’t have to prove anything to anyone. I’m just happy enjoying my racing. When I was racing professionally I constantly had to prove myself and make the connections for World Championships and Commonwealth Games, and whatever. I think that changing that mindset and not worrying if I don’t win – and realising the main thing is that as long as I’m enjoying it – has really helped. It just takes the pressure off, doesn’t it? Your own brain can be the biggest obstacle sometimes. Yes. 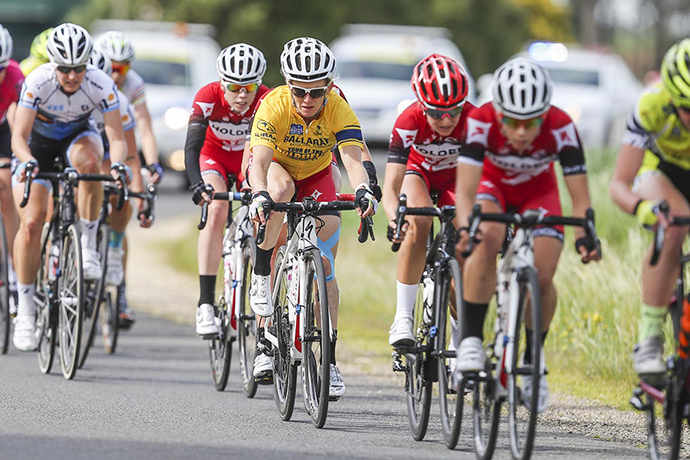 I can see other girls that race in the National Road Series, especially the younger ones, put extraordinary pressure on themselves to get results because they’re wanting to come over and make connections with the AIS [Australian Institute of Sport] to go and race over in Europe. I can see how they can put too much pressure on themselves and not enjoy it anymore because their whole focus is on results. The thing is, the selectors don’t necessarily look for results – they look for how girls work as a team; how do they sacrifice? It’s not just about winning or about getting a result – because it is a team sport, it’s about sacrificing for your teammates. Yes, and you did that a few times this year as part of that team strategy. Yes, that’s right. In terms of goals moving forward: You’ve got the New Zealand race and the NRS next year, but what are you doing before then I’m going to the Sunshine Coast this weekend – I’m racing Noosa Criterium tomorrow at 2.30pm. 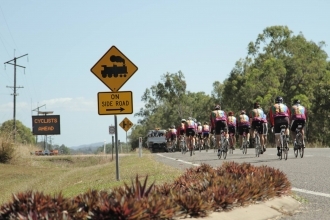 It’s part of the Noosa Triathlon Festival so there will be huge crowds and great prize money – $2500 for winning! I’m then racing a local mountain bike race in Redlands on Sunday – it’s great to get back on the mountain bike. Owen Matthews, my Ride Mechanic sponsor, has paid my way here which is great! And then, I’ll be racing in the Forrest Festival on November 29-30. 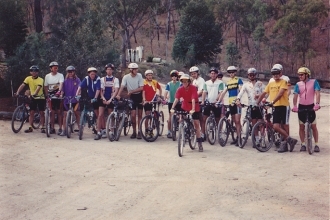 I’ve convinced a few of the other guys who I race mountain bike with to come down to Forrest too. 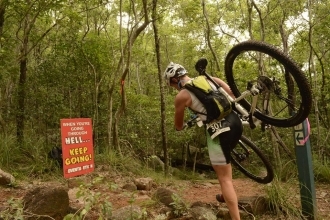 Do you think that the cycling community in Townsville, whether it’s road or mountain biking, is really strong at the moment? I think so because there are so many more people riding. There are so many more groups around and – because of that – there’s more competition and it’s great to see other local women go away racing. Hopefully there’s even more women that have the courage to do that next year. Any final thoughts or tips? I think one of the things that’s really helped me, and why I’ve been racing well, is that I’ve been training with this young guy: Chris Williams. He does whatever sessions I do and he really pushes us. He’s the one that cracked the Time Trial record up Castle Hill this year (8.33, with the previous record fittingly set by Ruth in 2011 at 8.57), so he’s a really good climber. He’s been training with me all year and I feel like I’ve been training a lot stronger with him. He won’t miss a ride; he’s always on time like me – I hate people who are late – and he really pushes me during my training sessions. I’ve really improved on my climbing because of him.